Every organization needs a workforce often. It is the job of human resource department to obtain information about the hiring of the staff such as the total number of people needed in the company, name of position on which hiring is to be done and a lot more details. Whether a company needs to hire staff or not depends on many factors such as revenue generated by the company, expansion of the company in the market and a lot more. When you are sitting on the seat of the human resource manager and you need to hire more staff, you will have to write staff hiring proposal to justify that you are in a real need to hire the staff. What is a staff hiring proposal? 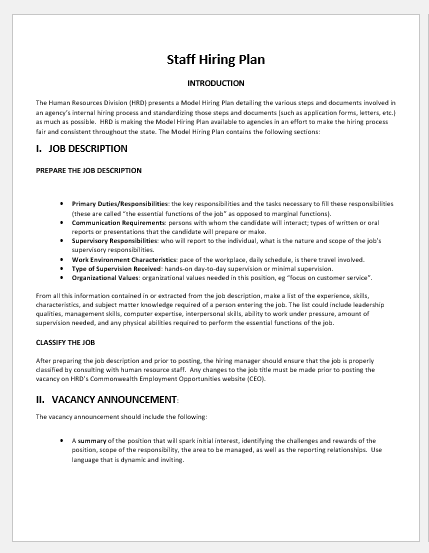 Staff hiring proposal is a document in which the hiring manager of the company requests for hiring more staff. It is a document in which those people show interest who want to get hired. This proposal is usually written by the companies when they want to hire additional staff. How to write the staff hiring proposal? The executive summary is the first part of the proposal that requires you to identify the purpose of writing the proposal. In this section of the proposal, the details about the proposal such as content are provided in a summarized way. The executive summary section also tells the reader how you will conduct the hiring process in the company. The person reading the executive summary should be able to know what your reasons are for hiring the staff. You should also tell how you will use the available budget to successfully conduct the process of recruitment. Although the proposal has made it clear that you need to hire staff in several positions, it is appropriate to mention your needs. This section can also include the eligibility criteria. Some companies also include the factors on the basis of which the preference can be given to certain people. The purpose of telling the needs of the company is to make the reader think whether or not he is capable of fulfilling the needs. In this way, only those people are likely to apply who are capable of meeting the needs of the company. This section explains the entire hiring procedure of the company. Candidates applying to a certain job position want to keep themselves updated about the recruitment process. They should be told the date on which the final announcement will be made and what will happen after that. The amount the hired staff can earn should be specified in this section. In other words, the money can be allocated for the upcoming staff is mentioned in this section.